Over the past few days, the dominant mood of Israeli media has been euphoria and celebration over the recent announcement by the outgoing Israeli intelligence chief, Meir Dagan, that even under worst-case scenarios Iran will not be able to build nuclear weapons at least by 2015. Referring to the latest revised assessment by Dagan of the chances of nuclear weapon development by Iran and similar adjusted assessments over the past decade, an Israeli intelligence analyst writes, “These adjustments were not the result of mistaken evaluations, but due to the difficulties Iran has encountered in advancing its program, largely because of the Mossad’s efforts”. Along similar lines, another Israeli self-identified ‘dove’ political analyst expresses his content with Dagan’s recent announcement by writing, “although blowing up some Iranian facilities and killing a few Iranian scientists were risky acts of aggression, they were worth it. They contributed to the hobbling of Iran’s pursuit of nuclear weapons, pushed its goal off by at least several years, so these acts of sabotage and assassination were justified”. These celebratory observations do not only characterize the mood of Israeli media and politicians. Many Western media and politicians also feel euphoric at the thought of Iranian nuclear program being disrupted by covert acts of sabotage. To cite only one example, the Washington Post wrote in a recent editorial reflecting on Dagan’s recent assessment that, “there appear to be solid reasons to conclude that U.N. and other Western sanctions and covert operations have hindered the Iranian program” and that “without more advanced centrifuges, Iran would have trouble in any attempt to create a bomb out of the low-enriched uranium it has stockpiled”. What accounts for this celebratory mood at the exaggerated news of damage to Iran’s nuclear enrichment facilities is the now-too-familiar assumption that Iran is hell bent on developing nuclear weapons and that the fact that Iran has not so far built nuclear bombs is because of the joint Western and Israeli covert operations and pressures. If anyone happens to ask Israeli or western politicians as to what evidence they have to believe that Iran is pursuing nuclear weapons, the familiar answer would be that it is Iran’s job to prove that it is not pursuing nuclear weapons. In other words, and absurdly enough, Iran is presumed guilty unless proved otherwise. This explains why, under pressure from world powers, the IAEA periodic reports over Iran’s nuclear program routinely state that they are not yet able to fully establish that there is no military dimension to Iran’s nuclear program, rather than simply stating that there is no evidence that Iran’s nuclear program has military dimensions. The international controversy over Iran’s nuclear program simply boils down to this unverified assumption that Iran is determined to produce nuclear bombs. However, no one among Western politicians seems to want to consider this plausible argument that the fact that Iran has not yet developed nuclear weapons is not because of technical difficulties or covert Mossad and CIA operations but simply because Iran has no intention of building nuclear bombs. The reports of IAEA inspectors and other nuclear experts have acknowledged the fact that Iran has long achieved mastery over uranium enrichment. IAEA’s Iran safeguard reports also verify that Iran has enriched uranium more efficiently over time and that the average monthly output of its enriched uranium has been increasing despite reports of Iran’s centrifuges being contaminated with the Stuxnet malware. Iran also demonstrated its technical capability and skill to enrich uranium to higher levels by producing a sample batch of 20- percent level enriched uranium on a short notice last year. This was carried out upon Western countries’ refusal to supply fuel for Tehran nuclear research reactor producing medical isotopes for cancer patients in return for the exchange of the bulk of Iran’s low-enriched uranium stockpile. IAEA reports have also verified that Iran has so far produced 40 kilograms of 20-percent level enriched uranium under the supervision of its inspectors. Despite its technical capability to enrich uranium to even a weapon-grade level, Iran has not gone beyond enriching uranium to a level suitable for use in nuclear power plants. 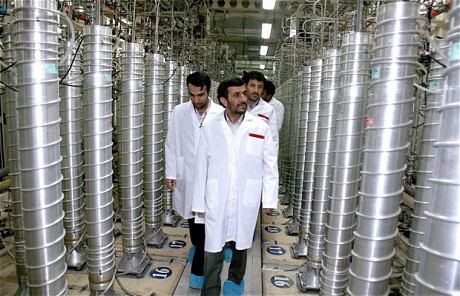 Iran also voluntarily offered to exchange most of its existing low-enriched uranium stockpile in return for fuel rods for its Tehran research reactor. This was purely a voluntary and confidence-building measure by Iran, as no international rules require Iran to give up its low-enriched uranium in return for purchasing ready fuel rods. Western officials did not even seem to wonder why a country that is allegedly bent on developing nuclear bombs soon would want to voluntarily give up most of its low-enriched uranium stockpile. Yet, Western governments did not seize on this opportunity to strike a deal with Iran and instead pushed ahead with another round of Security Council sanctions against it. A direct consequence of the Western confrontational policy toward Iran was that Iran was forced to start producing its own 20-percent level enriched uranium, as required in the process of building fuel rods for Tehran research reactor. Had the Western governments not gone ahead with imposing tighter sanctions on Iran and had they accepted Iran’s offer, Iran would not have mastered enriching uranium to 20 percent level now. This serves as a reminder that further tough measures by Western governments against Iran is only likely to further strengthen Iran’s resolve and push it to become more self-sufficient in nuclear technology. The unwarranted suspicion that Iran is bent on developing nuclear bombs has complicated the resolution of Iran’s nuclear issue and is likely to lead concerned parties on more dangerous paths in the future. Covert operations allegedly undertaken by western and Israeli intelligence agencies in the form of creating and spreading computer malwares and sponsoring terrorist attacks against Iranian nuclear scientists with a view to disrupting Iran’s nuclear program are extremely risky adventures which may entail grave consequences for the settlement of Iran’s nuclear issue. Iran’s fingers are already pointed at Israel, the U.S. and Britain for the assassination of its nuclear scientists. To say the least, Iranian response to these overt and covert acts of hostility against its nuclear program will not be positive. While killing the chances of a diplomatic solution to Iran’s nuclear issue, the covert Israeli and Western operations against Iran’s nuclear program are also not likely to achieve their intended goal of disrupting Iran’s nuclear program. The main reason for this observation is that nuclear experts closely monitoring Iran’s nuclear activities do not share the exaggerated view of the Israeli and Western politicians and media of the extent of damage caused to Iran’s enrichment facilities by the Stuxnet computer worm. A technical report issued on December 22, 2010 by a team of nuclear experts at the Institute for Science and International Security on the impact of Stuxnet computer worm on Iran’s uranium enrichment facilities concludes that Stuxnet may have succeeded in disrupting a limited number of Iranian centrifuges temporarily but if the goal of Stuxnet was to quickly destroy all the centrifuges at Natanz enrichment center it failed. IAEA reports also indicate that the monthly low-enriched uranium output at Natanz flattened but never came to a halt from mid-2008 to late 2009 and that it has substantially increased ever since. To say the least, these acts of covert sabotage against Iran’s nuclear program are inimical to the very spirit of diplomatic negotiations aimed at resolving Iran’s nuclear issue. They are likely to further strengthen Iranian resolve in pursuing its uranium enrichment program and create more domestic public support for Iran’s nuclear program. Not to mention various retaliation options available to Iran, these acts of hostility toward Iran are also likely to force Iran to limit its cooperation with the IAEA in order to minimize harm to its nuclear program. Taking these consequences and realities into account, there should be no reason for celebration by all concerned. Abolghasem Bayyenat is an independent foreign policy analyst covering Iran’s foreign policy developments. His earlier commentaries and articles can also be accessed on his own website, IranDiplomacyWatch.com.